Wild Woman, Linda Runyon Eats the Trees! 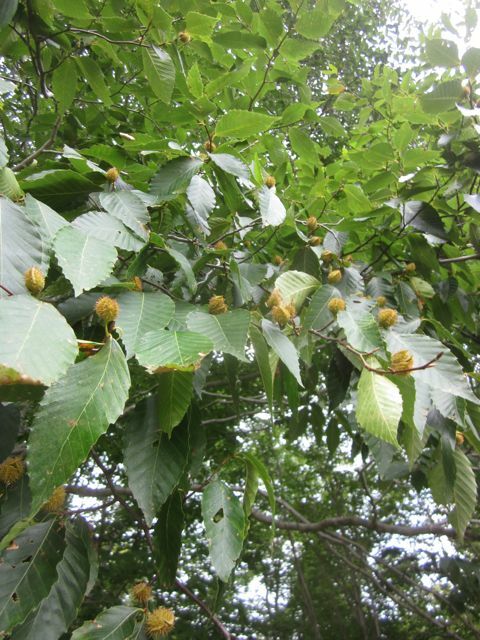 You are here: Home / Uncategorized / Wild Woman, Linda Runyon Eats the Trees! My bookshelves are bulging with a plethora of wild food books, but the ones that I rely on are authored by my mentor and personal wild hero, Linda Runyon. Linda lived in the wilderness of the Adirondack mountains in an off the grid cabin with her husband and young son for 13 years. She foraged for their food for breakfast, lunch and dinner year after year. She did not have her book to refer to and learn from…she learned by doing. They not only survived but they thrived. Upon leaving the cabin Linda continued her homesteading life style…this time for 13 years in the Arizona desert. This gave her a grasp on edible plants in a completely different terrain. Her best selling book, The Essential Wild Food Survival Guide features 52 of the most prevalent wild edible foods that are commonly found around the world in any terrain. 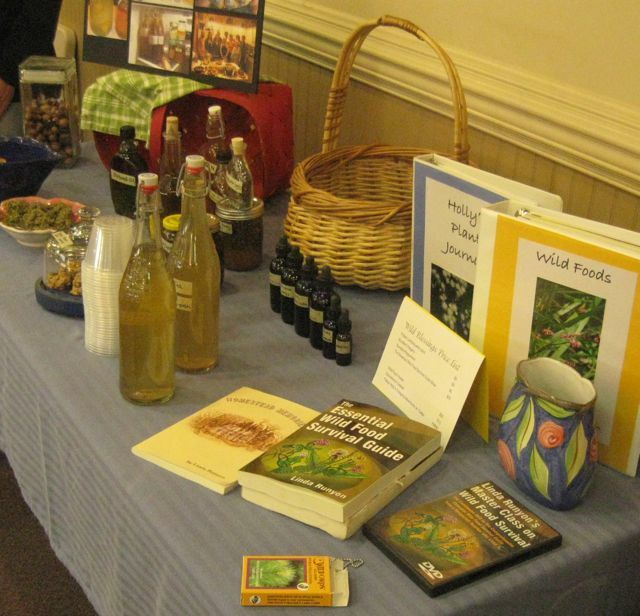 She teaches how to identify, gather, preserve and cook with these wild gifts including many tried and true recipes and nutrition facts for each plant. Linda illustrates all of her own works with her detailed pen and ink style. The Essential Wild Food Survival Guide is a must have for any serious forager. I own several copies, one by my computer for easy reference, one in my backpack for when I’m shopping in the wild and one to loan out to friends till they can obtain their own copy. If you can only purchase one wild food resource this is it. Another of her books, Homestead Memories, tells many of her charming and some alarming stories of their years together in the wild. It is not only nostalgic but educational as you can learn from her smart choices as well as a few close calls. Great read aloud material for you and your kids. 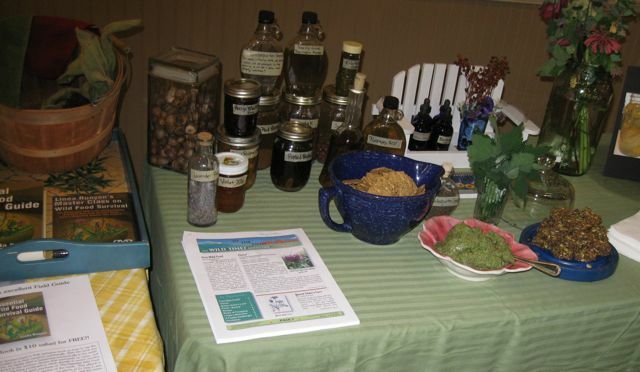 Linda’s three hour DVD, put together by her son in 09, shows Linda teaching on all 52 key wild edibles and telling more details than even her books offer. I love showing parts of that after my wild food dinners to my guests so they can learn from the best. Her WILD CARDS® are a great tool to use when you are learning the identification, attributes & uses of Wild Foods. Linda’s core 52 wild edible plants are printed in brilliant color and clarity on the backs of the cards. The cards contain the crucial info needed to deal with an unexpected emergency or survival situation in which knowledge of edible wild plants could save your life. Linda created these for the military as a key component to a survival pack. I carry mine with me in my purse and also in my backpack. They are also a deck of playing cards! I strongly recommend learning from Linda. Her website is http://ofthefield.com/ and it is a treasure trove of wild knowledge and endless learning. She puts out a free monthly newsletter that comes to your email inbox. Each issue featuring wild edibles for the present season…complete with recipes and foraging tips. Linda’s Foragers Forum is the most exhaustive nature forum that I have ever participated in and covers every possible topic from foraging rules to preservation of the harvest. It is a vital community of kindred spirits. Her latest book, Eat the Trees, was just released in August 2011. I had the privilege of perusing the manuscript before it went to press and was so inspired I am finding myself looking UP more than down to see what it is that the trees are offering. Once again Linda has opened a whole new wild horizon to me and I am thrilled to include these massive green grocery store gifts on my dinner table. 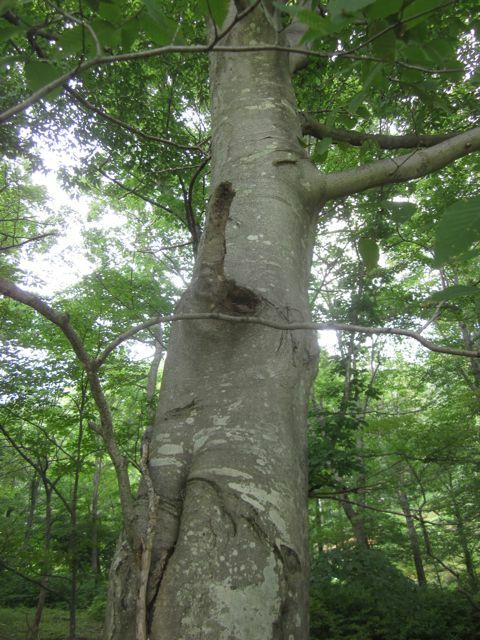 The impetus for Linda’s tree eating escapades happened over 30 years ago on one subfreezing night, 30 degrees below. Her refrigerator at the homestead was a 9 foot deep pit in the earth. 420 jars of hard earned wild foods from the previous Summer had been carefully canned over the campfire and were stored ‘safely’ in the below ground frig. During this particularly freezing night all of these jars froze exploding the glass and their wild contents for her to discover in the morning. With a bewildered and heavy heart Linda looked up from the broken glass and saw the trees above her….as the Iroquois before her she turned to the trees for food to help her family survive the winter. So that was the impetus for this current book, Eat the Trees, and though it has taken her decades to write it for our learning it is here now. I can not recommend it highly enough. Another amazing free gift from Linda are her weekly podcasts. She has been a regular Monday guest on George Whitehurst Berry’s radio show, “Crash are You Ready?” Each program Linda talks extensively about one wild food topic: edible flowers, drying techniques, edible grasses, how to make wild flour, or an entire episode on just one wild plant, wild plant first aid kit ideas, survival tips… It is an amazing resource. You can download any of these programs from Hearitonline.com under the archives. Hear It Online archives http://www.gcnlive.com/programs/crashAreYouReady/archives.php. The actual topics and the dates Linda is interviewed are posted on her website http://ofthefield.com/. When I get a chance I will post them here at Wild Blessings.com as well. I look forward to every show and am glad I have an iPod so I can fast forward over the MANY commercials on George’s program! 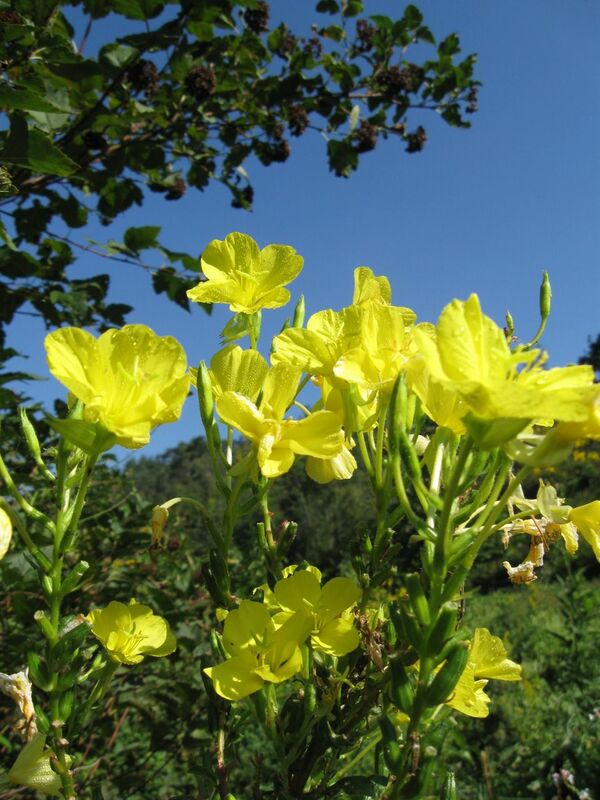 Linda Reminds me of the Vivacious Evening Primrose, a Life Giving Gift from God! Linda will never grow old. She is vitally involved in her community teaching the elderly at her retirement center how to make wild food wreathes or rose petal jewelry…. 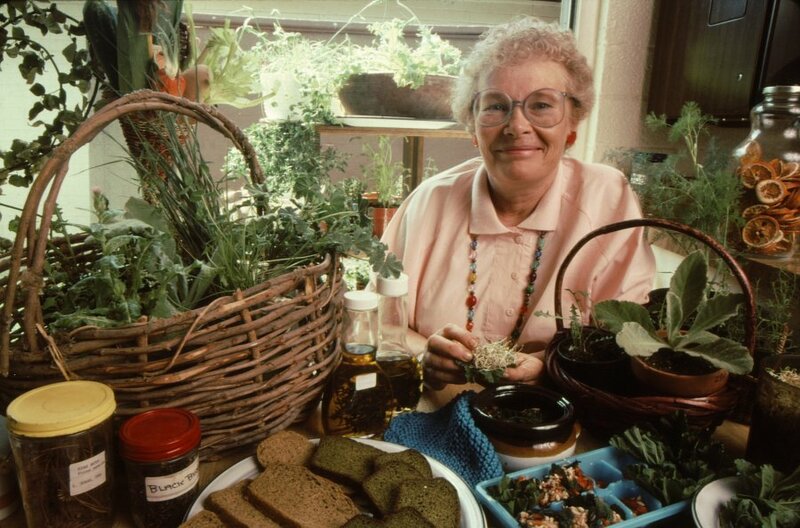 Her beloved wild food is still her main stay of nutrition as she keeps it wildly growing in containers on her porch or indoors in the Winter. She is always writing something and coming up with new ideas for how to spread Wild fires. Her enthusiasm is contagious and she pours herself into passing on her knowledge and experience into eager learners, like me. 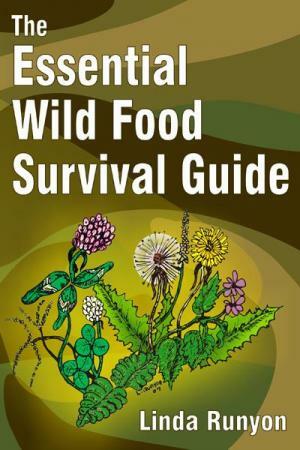 When you purchase The Essential Wild Food Survival Guide from Linda’s Of the Field.com website, mention my name, Holly Drake, by email to them, and you will get her eBook of recipes for free. 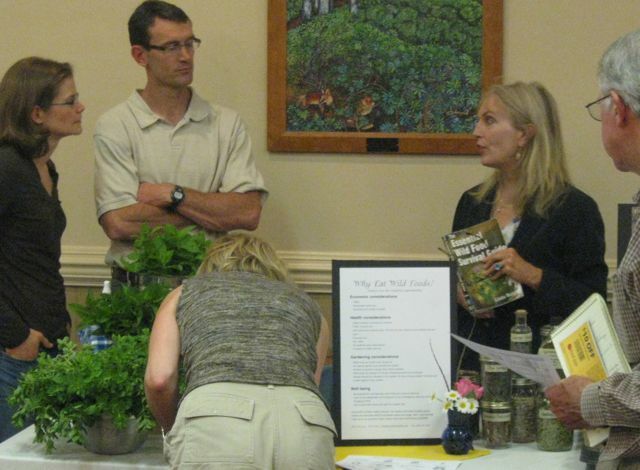 Get to know Linda and benefit from her vast wild knowledge and experience! Holly, I so enjoy each article I read on your site. I am so excited about sharing you with others. Also, I’m looking forward to taking my interests a step further. 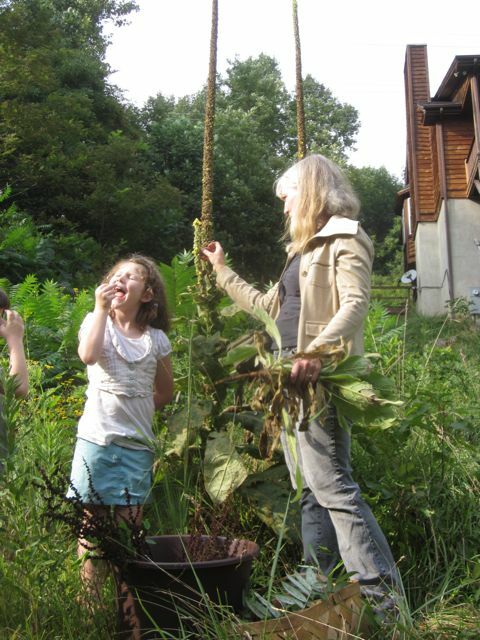 Tomorrow, early, while it is still cool, I plan to take my daughter on a little hike to search for curly dock and harvest some seeds. I’m not exactly sure how to get the seeds out of the little casings. Can you direct me on that? The flowers mature into russety reddish-brown seeds which stay on the stalk for months, providing important nutrition to birds when snow covers the ground. To prepare the seeds, I strip them off the stalks and rub them briskly between my palms. While not sharp, the seeds and stalks are abrasive, so you may want to wear gloves if you are going to process a lot. It is nicest to do this outside in a light breeze. With a little practice, you can get the wind to take the husks away for you. Inside, you will need to use a sieve with holes too small to allow the seeds through, but big enough to pass the husks. Don’t worry if some husk is still in with the seeds. They won’t hurt you; they’re just bitter. Seeds can be stored in glass jars until ready to use. They last about 20 years. Just before cooking, I lightly toast the yellow dock seeds in a cast iron skillet. This improves both the flavor and digestibility. Ordinary buckwheat seeds are white when harvested but brown when we buy them because they’ve been toasted. I usually grind my toasted wild buckwheat and combine it with wheat flour in pancakes (yum), muffins, and breads. Thank you for this great information. My daughter and I did go to look for the curly dock, but were not successful finding that particular plant. What we did find were cattails and were happy to have found some beauties. We boiled some that still were pretty green but turning brown, and I think it is just a little late in the year. They were ok as far as taste, but not easy to chew. It was a fun experiment, though. We enjoyed the fresh shoots and saved some for salad later. I’ll keep looking for yellow dock. Oh, thanks also for the reference to Susan Weed. I know of her. This is great!